It’s unofficially summer in this edition of things to do this weekend June 8-10. Although mother nature is still playing tricks on us from time to time, summer begins in Lake County (well and the rest of the world north of the Equator) on June 20. With summer comes parties, and Lake County has plenty of them. Continue here to see a summer festival season in Lake County. Also with the temperature rising, we tend to gravitate towards a sandy shore. Click here to learn more about Lake County’s relaxing beaches. To learn about everything going on in June, continue here to read about our top 10 for the month. The summer countdown is officially 13 days away as we look at Lake County’s top five things to do this weekend June 8-10. Get a glimpse of the PGA TOUR’s future stars at the Rust-Oleum Championship. This tourney at the Ivanhoe Club features 50 players from the Web.com Tour looking for the chance to earn pro status on the PGA TOUR and take home the $600,000 purse. This championship has showcased the talents of now PGA stars like Jason Day, Zach Johnson, Keegan Bradley, Ernie Els and more. 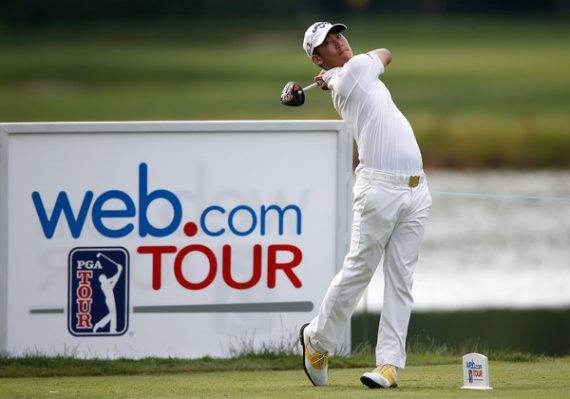 The field of 156 competitors features Sungjae Im, Scott Langley and Kyoung-Hoon Lee, who are currently in the top three positions in the Web.com Tour standings. The championship round runs through Sunday, June 10. Friday-Sunday, June 8-10. Ticket Price: $21.40-$102.10. The Ivanhoe Club, 28846 N. Thorngate Dr., Ivanhoe. Mundelein Community Connections and Tighthead Brewing Co. joined forces to host the seventh annual Mundelein Craft Beer Festival. Admission for this event includes a souvenir tasting glass and brew samples from over 30 local breweries. The libation party features live tunes from Bellwether Blues and Gina Gonzalez and the Wingmen as well as local restaurant vendors and food trucks with delectable dishes for purchase. Designated driver tickets are available. Saturday, June 9; 1-5 p.m. Tickets: $45. Mundelein Village Hall, 300 Plaza Circle, Mundelein. This year marks the 75th anniversary of the legendary American classic “OKLAHOMA!” We’ve reached our final week of the legendary show on the Lincolnshire stage. Fall in love with your favorite characters again, Curly McLain and Laurey Williams and the tale of the American frontier. The musical hit Broadway in 1943 and has graced over 2,200 stages. Rodgers & Hammerstein won a Pulitzer Prize for this show, and the production named after the Sooner State became an Academy Award-winning film adaptation in 1955. Friday, June 8 is sold out. Saturday-Sunday, June 9-10; Sat. 3 & 8 p.m., Sun. 1 p.m. Marriott Theatre, 10 Marriott Dr., Lincolnshire. Take a leisurely stroll on the MainStreet Libertyville Historic Home Tour. Four homes will be showcased including an 1897 constructed home located along St. Mary’s Road. The 19th-century home sits on 15,000 square feet of land and is a converted dwelling from a once school and convent. Tickets to this tour can be purchased online at mainstreetlibertyville.org at $15, but they’re also sold on event day in Cook Park for $20. Saturday, June 9; 10 a.m.-3 p.m. Tickets: $15-$20. Cook Park, 413 N. Milwaukee Ave. Libertyville. After 39 years in the music industry, Anita Baker has announced her retirement. But before she calls it quits, the eight-time, Grammy-winning songstress is gracing Ravinia Festival’s stage one final time. The contralto singer is known for hits like “Sweet Love,” “Giving You The Best That I Got,” “Body and Soul” and many other Billboard Chart toppers. Don’t miss the Detroit diva’s farewell event at the Highland Park venue. Sunday, June 10; 7:30 p.m. Tickets: Lawn $38, Pavilion $85-$95. Ravinia Festival, 418 Sheridan Rd., Highland Park. For more things to do this weekend June 8-10, continue here.